Thank you for your interest in BarterWorks. BarterWorks opened its doors on August 19, 1996. WE ARE CERTIFIED THrough IRTA. THE INTERNATIONAL RECIPROCAL TRADE ASSOCIATION IS A NON-PROFIT ORGANIZATION COMMITTED TO PROMOTING JUST AND EQUITABLE STANDARDS OF PRACTICE AND OPERATION WITHIN THE MODERN TRADE AND BARTER INDUSTRY. THIS means that BarterWorks is committed to follow a very stringent Code of Ethics. If you are visiting our website as a non-member, please understand that our local membership directory is password protected, and can be accessed by members only. Members of BarterWorks have access to local members as well as many items from around the world (the Marketplace) offer by many other exchanges members as well. The many exchanges that belong to The Trade Alliance and choose to trade with each other, are what truly makes The Trade Alliance one of the largest offerings of products and/or services to all of our members. If we can help answer any questions, please don't hesitate to contact us. Since ancient times, people all over the world have traded goods and services using the barter concept. If they needed a tooth pulled, they gave the dentist a chicken. If he didn’t want the chicken he later traded it for the hay he did need. We refer to this type of trading as "Little House On The Prairie" as that's about how outdated that form of trading is! Unlike in the past, BarterWorks never forces you to take anything you don’t want or need. The goods and/or services aren’t directly traded. They are bought and sold using BarterWorks trade dollars, much like your checking account. BarterWorks is the bank acting as third party recordkeeper. We post all transactions keeping your account current and send out your statements on the first of every month for all activity from the previous month. Neat, clean, above board and perfectly legal. Laurie A. Dancer began her barter career as a proactive barter broker in 1991. In wasting no time, in 1992, Laurie became a CTB (Certified Trade Broker) through IRTA, the governing body that oversees barter companys operating legally in the United States. Laurie achieved numerous awards in the barter industry, however she was frustrated over the lack of customer service she witnessed there. In the spirit of entrepreneurship, Laurie launched BarterWorks on August 19, 1996. In February, 2005, Laurie moved her companys software to The Trade Alliance and has never looked back. She became a dual CTB, also getting this distinction through The Trade Alliance. There her members can enjoy not only utilizing the local market of BarterWorks member, but they can also use their trade dollars to shop the Marketplace, where members from some 60+ other barter companies can place their goods and/or services to gain more sales from other exchanges. Today BarterWorks features many unique members and is a growing professional barter company. BarterWorks operates mostly as a concierge type barter company, without inflating numbers of actual members, but instead works very hard to secure special requests from members of what they really want or need. Laurie serves as the CEO and personally oversees the company. She is committed to making BarterWorks work! BarterWorks members make a choice to purchase items or utilize the services from our list of current members. When a member makes a purchase their trade account is debited and the sellers account is credited. Accounting is done in real time. A member can check their account 24/7 by logging into their account through the BarterWorks website with their User ID and password. There members can find all information on their accounts including, complete history of transactions, fees currently due, items that they have listed in the Marketplace, update their credit or debit card information, and shop locally or systemwide.. This software was developed by Alan Mink, an industry lead for many years. It is all done in real time and is the leading software of the barter industry. My company has been with BarterWorks for many years. We have greatly enjoyed the personal attention we get from all the members of BarterWorks. I have tried other barter companies and have had success with only one - BarterWorks. They have quality members, not quantity, and that is what makes an excellent barter company different from an average one. As a brand new start up company and being young, my business partner and I had minimal funds for the things that we needed to get our company up and going. BarterWorks was a tremendous help. We traded for everything from printing, advertising to shirts and a booth at a very well respected trade show. We are truly excited to have this opportunity to be a part of BarterWorks and look forward to a very long a prosperous business relationship. Because our company has been burned by barter opportunities in the past, we now check out everything and everyone and really do our due dilligence. BarterWorks is the only local barter company that we checked out that passed with flying colors. They may not be the biggest barter company, but to us the biggest isn't always the best. Check it out for yourself. Do background checks and put the owners names of other barter companys into Google and see what you get. Oh boy!!! These BarterWorks Trading Rules and Regulations were written by IRTA, the barter industry’s governing body of all barter companies operating legally in the United States. These were written and accepted by BarterWorks on its opening day of business – August 19, 1996. The following terms and conditions constitute the contract by and among member and BarterWorks. In order for your account to be opened by BarterWorks (hereinafter referred to as BarterWorks) you had to check the box that said you would agree to the BarterWorks Trading rules and regulations, which are also listed on the website for you to read before signing up to become a member (hereinafter referred to as member). By checking that box, it constitutes acceptance of all terms, conditions, policies and procedures as most recently adopted by BarterWorks. They apply to all BarterWorks members and to all transactions facilitated by BarterWorks. At its sole discretion, BarterWorks may amend these BarterWorks Trading Rules and Regulations by sending members an email notice that the BarterWorks Trading rules and Regulations have been amended, and the amended copy is updated on the website for all to see. The amendment of of these Trading Rules and Regulations constitutes changes effective the date of notice. BarterWorks is an association of businesses and professionals who have joined together to do business among themselves through the organized system which is regulated by the recordkeeping and administrative services of BarterWorks through the medium of BarterWorks trade dollars. BarterWorks regulates the network and acts as a third party record-keeper and oversees the clearinghouse function of the network for the members. Member desires to do business with other members of the network and hereby subscribes to BarterWorks services. Member warrants that it is in compliance with all State, Federal, Industry and Professional laws and regulations. BarterWorks reserves the right of final approval of this agreement and may refuse to accept anyone as a member for any reason it deems necessary, at any time. The signer of this agreement hereby acknowledges that they are over 18 years of age, and that they have the authority to join BarterWorks on behalf of their company, and that they corporately and personally guarantee the trade activity, fees generated and work performed by all on behalf of their company to BarterWorks members. BarterWorks makes no representation or warranty, either express or implied, and disclaims all liability, as to the fitness, quality, delivery date, prices or any term of any trade transaction. Member agrees to indemnify and hold BarterWorks harmless with respect to any claim, debt, or liability whatsoever, arising out of any transaction wherein member is a Buyer or Seller. Member acknowledges that any transaction facilitated by the network, in which member participates is entered into by member on a voluntary basis. Seller shall be solely responsible to collect and remit to the appropriate taxing authorities the applicable taxes and shall collect and record these as required by law. Under no circumstances is BarterWorks responsible to pay any taxes on behalf of any member. Transactions involving BarterWorks trade dollars are generally treated as taxable events for federal, state or provincial, and local tax purposes and BarterWorks reports sales to the appropriate government taxing authority. The declaration and reporting of applicable taxes resulting from trade transactions rests solely with the member. Member agrees to indemnify and hold BarterWorks harmless for any actions BarterWorks takes to comply with federal, state or provincial, and local laws. Members conduct transactions (purchases or sales of goods and/or services) using the BarterWorks online system, or by requesting BarterWorks to post the transaction on its online system. Payments are made by posting debits and credits to the buying and selling member's respective accounts, pursuant to these Trading Rules and Regulations, and in the form of BarterWorks trade dollars. BarterWorks trade dollars are a private currency which operates as contractually accepted tender for specified private debts only, between exchange members, backed only by the goods and services available within the network, and regulated by BarterWorks. These trade dollars denote value received for goods or services sold, and may be utilized only to purchase other goods or services made available by BarterWorks members but must run through buyers and sellers accounts so that BarterWorks may bill their appropriate transaction fees as per these Trading Rules and Regulations. At no time are members permitted to do “direct trading” with each other, without posting the transactions through BarterWorks to post appropriately to each account. Trade dollars may be used only in the manner and for the purposes set forth in these BarterWorks Trading Rules and Regulations. Neither BarterWorks nor member shall consider BarterWorks trade dollars as legal tender, securities, or commodities. BarterWorks disclaims any and all responsibility for the acceptance or negotiability of BarterWorks trade dollars or for the availability of goods or services from any source. Member acknowledges that BarterWorks trade dollars in the network (positive balances) are the liabilities of persons who have spent more than their earnings (negative balances); that there is a creditor/debtor relationship between such persons, and that BarterWorks transactions incur the normal business risks associated with any credit transaction. Any negative trade balances are solely the liability of members who owe BarterWorks trade dollars to the exchange and are not the liability of BarterWorks. Member acknowledges and grants to BarterWorks the right and power to regulate and control the number of BarterWorks trade dollars within the network. Member understands that the seller is responsible to get an authorization from BarterWorks PRIOR to beginning any work for any buyer. That is the only way that seller can guarantee payment from BarterWorks member. BarterWorks has the complete authority to edit the trade amount or reverse the transaction if the work is not begun or completed within a timely fashion, is not considered quality work, is not finished as promised, or by written agreement. Member also grants to BarterWorks the right and power to borrow from the network. Member is NOT authorized to sell BarterWorks trade dollars for cash under any circumstance, however on permanently closed accounts with forfeited or seized trade dollars, BarterWorks may at its sole discretion, have the right to sell those trade dollars to a member having a difficult time making sales to cover their negative trade balance, or to cover lost revenue from transaction fees, etc. If member violates any part of these BarterWorks Trading Rules and Regulations, or BarterWorks or members or member panel (if available) feels that member is not a good fit in the BarterWorks system, BarterWorks may at it's discretion immediately terminate members account or may freeze all activity in the account with notice and/or make immediate adjustment to the transactions involved. At its sole discretion, BarterWorks may reinstate member or unfreeze members account. BarterWorks may also, at its sole discretion, terminate a members account if it feels that they not a good positive member for BarterWorks and/or its members. Either party may terminate this Agreement by communicating that decision to the other party. Upon termination, all fees including spend out fees immediately become due and payable. No fees will be refunded for any reason. Regardless if BarterWorks or member is terminating the account, any member with a negative trade account balance (where purchases exceed sales) may, with BarterWorks approval, balance their account with product, service and/or non-expiring gift certificates. This must be completed within 7 days of termination date. If for any reason BarterWorks cannot accept product, service or gift certificates to satisfy a negative trade balance deficit, or member is not able to provide product, service or gift certificates to satisfy a negative trade balance, then member's card on file will immediately be charged for all fees and negative trade balance due in cash. Any Member with a positive balance (where sales exceed purchases) must spend their account balance within ninety days of termination, after any outstanding fees that are due (including spend out fees) are paid in full. All fees become due and payable immediately upon notice of termination. Member will be able to spend the trade in their account but may not go into a negative trade balance. If going into the negative balance is needed to complete a transaction, member will pay the difference in cash to BarterWorks BEFORE the final transaction is completed. In addition, spend out fees on the buy end only will be assessed on the account (5% of the positive trade balance if an active, current credit or debit card is on file. If not, 6% cash is the adjusted spend out fee. BarterWorks also may, at its sole discretion, extend the 90 day spend out period. This extension of spend out time will be based on the professional demeanor of the terminating member. In any case, the cash fees are still due and payable immediately upon notice of termination. All fees paid to BarterWorks are completely non-refundable. If buyers or sellers do not complete a transaction, or if performance of members' obligations to each other is disputed, BarterWorks will not be obligated to refund any fees it has received. The only time that BarterWorks is obligated to refund the fees is if BarterWorks has made an accounting error. All members are required to have a current, active credit or debit card on file at all times. Your card on file is debited the 1st of each month, same day your statement is emailed. If card on file is declined for any reason, a $35 NSF fee will be assessed. Transaction fees are 5% cash – buy or sell. If a current, active credit or debit card is not on file, the transaction fees will be 6% cash – buy or sell. Some accounts which would be considered a major account (bigger ticket items, extra brokerage time, etc.) may be charged a higher transaction fee. Ongoing transaction fees are a percentage of all transactions, buy or sell. All transactions generate a transaction detail sheet that is emailed to buyer and seller, to the email address supplied by member. This is done in real time. Member can also log in to their account 24/7 to get all of their account information including fees due, complete transaction history, etc. Additionally statements are emailed on or near the 1st of every month with complete account activity itemized. BarterWorks has the right to collect fees due from the credit or debit card on file anytime they are more than $5. Fees due for more than 7 days from statement date will be assessed a late fee of $25.00 cash, or 1.50% of the unpaid balance, whichever is greater. Fees still unpaid after 15 days will have the account frozen to trades. Fees due after 30 days will give BarterWorks the ability to seize all trade dollars in members account. Fees however are still due and payable. Ongoing monthly fees ($10 cash) are assessed to assist BarterWorks in running the exchange. October 1st of every year, all accounts are billed a one time $100 cash fee, which prepays the upcoming years monthly fees, with 2 months free. A negative trade balance (after 30 days) will have a 1.5% cash fee added to the account on each statement (monthly) thereafter until the account is in a positive position. This is to prevent member from overspending their account but not selling back into the system in a timely fashion. 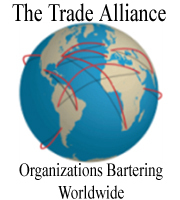 By acceptance of this agreement by checking the box when you filled out your membership application to agree to abide by the BarterWorks Trading Rules and Regulations, the member agrees personally and corporately to guarantee payment of all cash fees and is responsible for all negative barter account balance, if any. Member shall abide by applicable International, Federal, State or Provincial, and local laws or regulations pertaining to exchange transactions. BarterWorks shall not be responsible for any failures on the part of member to comply with such laws and regulations. Member agrees not to hold BarterWorks liable for any action BarterWorks takes to comply with applicable laws or regulations. BarterWorks failure or delay in exercising any right, will not operate as a waiver of that right, nor shall the partial exercise of a right preclude any other or further exercise of any right. BarterWorks remedies are cumulative and are not exclusive of any remedies provided by law. Every item contained in this agreement is separate from every other term herein. If any term should be judged unenforceable, it shall not affect the enforceability of other terms outlined in this agreement or BarterWorks Rules and Regulations. If legal action must be taken by BarterWorks, member shall pay BarterWorks reasonable attorney's fees, costs, plus interest from the date of default until payment in addition to any other judgment as granted by a court of law or an acceptable arbitration. If BarterWorks ceases to do business, all member's in a negative BarterWorks trade dollar position will pay amounts they owe in cash (one BarterWorks trade dollar being equal to one United States dollar in cash) immediately into a fund designated by BarterWorks corporate attorney.. The fund, less expenses, will be distributed pro rata to all members' who are in a positive BarterWorks trade dollar position. BarterWorks is not liable to any member's for cash or BarterWorks trade dollars beyond the distribution of such funds. Member hereby grants BarterWorks a security interest in all trade dollars in member's account for the amount of all unpaid cash fees. If member becomes insolvent or bankrupt, all cash fees shall be due and payable in full in order to reinstate account. BarterWorks shall have the option in lieu of filing as a creditor, of treating the trade dollar balance as equal in value to the amount of cash fees owed, and terminating the account; provided however, that if BarterWorks does receive all of its cash fees in full, BarterWorks shall reinstate the trade dollars to the member's account. Member warrants that it provides all information to BarterWorks in good faith and that such information is accurate to the best of member's knowledge. BarterWorks will, and member agrees, that BarterWorks may accept a faxed or e-mailed signature as an original, legal signature. Member acknowledges that it is not relying on any oral representations concerning this Agreement and that the complete agreement between the parties is contained in these Trading Rules and Regulations. In the event of a dispute between BarterWorks and member resulting in a judgment entered on behalf of the member against BarterWorks, member agrees that BarterWorks shall have the right to satisfy said judgment in BarterWorks trade dollars to fully satisfy the judgement, if any. This agreement shall in all respects be construed under the laws of the State of Arizona. Any possible legal matters shall first be brought in front of the BarterWorks Arbitration Panel for possible resolution with the least amount of time and costs involved to all parties. Click here, and be sure to fill everything out in its entirety (this should take you about 5 minutes). Don't forget that you must include your Federal/Tax ID number and your credit or debit card. Do not worry, this site is encripted at the highest level. BarterWorks will then receive notice in real time that you have started your membership application. Upon acceptance, BarterWorks goes to work actively marketing you as a new member. By using our state-of-the-art online system BarterWorks lets members know that you’re onboard and ready to trade! Once you’ve made your first sale, you can begin to make purchases. It’s like an additional source of revenue, without cash! Please feel free to contact me any time BarterWorks may be of assistance to you.